COLOR MASK OROTHERAPY is the new professional range of 9 masks illuminating and reviving, embellished with 24 k Gold, Keratin and Argan oil, for the production of endless colour effects, secure and customizable. COLOR MASK is suitable for natural hair, colored and highlighted hair and is ideal to liven up the color in a color and the other to illuminate with glisten whenever hair is present off, opaque and devoid of vitality. 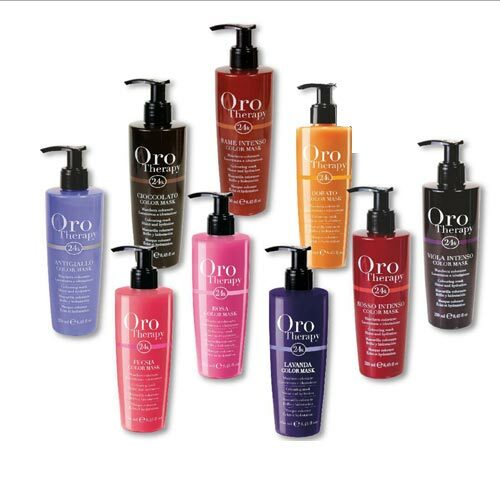 Enhances, intensifies, brightens and protects the color, nourishes, moisturizes and conditions the hair. The exclusive synergy Gold, Keratin and Argan oil allows you, with just one product, to brighten the natural color and cosmetics industries, restructure the hair, counteracting the formation of free radicals.